RAND houses three defense-based federally funded research and development centers (FFRDCs): the Arroyo Center, sponsored by the U.S. Army; the National Defense Research Institute, sponsored by the Office of the Secretary of Defense and other elements of the Department of Defense; and Project AIR FORCE, sponsored by the U.S. Air Force. These FFRDCs apply the "research capital" they have developed over the years to help decisionmakers not only solve problems but also save money. This publication lists and summarizes recent projects that have helped save the government money or identified ways to do so. Dollar amounts are estimated. Benefits of these projects include savings achieved or under way (e.g., from studies of military pay increases and DoD supply chain integration), savings projected if RAND recommendations are implemented by the government (e.g., from studies of aircraft carrier alternatives and military retirement reforms), and savings enabled by RAND's independent validation. 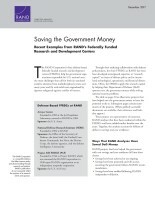 Saving the Government Money: Recent Examples from RAND's Federally Funded Research and Development Centers. Santa Monica, CA: RAND Corporation, 2017. https://www.rand.org/pubs/corporate_pubs/CP485-2017-12.html.